Fitbit Flex 2 – with removable tracker for your individual style. Spend your day stylishly. You get a fitness tracker and a fashion accessory in one with the Fitbit Activity Tracker Flex 2. 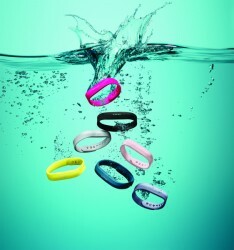 The activity tracker can be easily removed and be used with many wristbands or the appropriate accessory. Hence, you find the appropriate style for each event without having to forgo your Fitbit Activity Tracker Flex 2. If desired, you are informed about incoming calls or messages on the small LED display by flashing display lights as well as a soft vibration - provided that it is connected to a compatible smartphone. Different LED colours as well as individual colour encodings inform you quickly whether you get a call or just a SMS or messages. The integrated lithium-polymer battery convinces especially by its strong battery lifetime of up to five days. The charging time is just one to two hours. The smart activity tracker of fitbit records all daily activities like steps, burnt calories, active minutes, hourly activities as well as rest periods. At the same time, the Fitbit Activity Tracker Flex 2 monitors your sleep thanks to an automated sleep detection and awakes you softly with a mute alarm of a soft vibration. Thanks to the Smarttrack function, your fitness tracker detects automatically specific activities and records those in the training section of the Fitbit App. The integrated movement reminder gives you a friendly movement reminder, in case you have not achieved your hourly target of 250 steps. The Fitbit Activity Tracker Flex 2 is waterproof and allows you to wear it while taking a shower, while swimming in the sea or in a pool. The activity tracker detects automatically once you are in water. Via the Fitbit App, you get a very good and detailed oveview about your training data as well as an excellent analysis of your resting periods at night. The App can be easily downloaded and offers an intuitive use. Best pedometer on the market, thanks to its advanced online services, which can integrate with HealthVault! Jediné mínus vidím v ne příliš velké výdrži baterie, opravdu déle než 5 dní nevydrží. Jinak ale nemám co vytknout, naprostá spokojenost!! Das Produkt ist sehr interessant. Mangelhaft ist der Verschluss des Armbandes. Das Verschliessen ist sehr mühsam und das Bank kann leicht verloren gehen.